The Invader Jet Dragster was paired up with Al Arriaga’s Blu-By-U driven by his son, Scott. Paul Stender also brought three of his jet powered vehicles, a jet powered Jeep, a jet powered Dodge Ram, and yes a jet powered outhouse. Saturday, we had one run scheduled with Scott, Paul in his Jet Dodge Ram ran as we were getting ready. With dusk setting, we fired up the beasts and proceeded to heat up the desert air a little more. 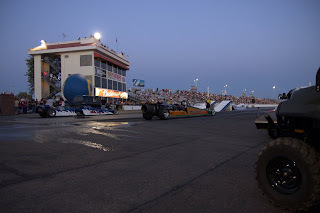 With the two dragsters ready and eager to launch, the tree flashed and so did the jets. Scott left quicker that the Invader but they held pace for the first 500 feet, then it seemed as I missed the tune up as Scott just pulled hard. After reviewing the timing slip, we figured out the problem. It was not us, it was Scott! We ran a 5.56 to Scott’s 5.35 @ 301 mph. With Sunday, it was a repeat schedule but during the day. Hotter day but brought out the crowed anyway! With a repeat of the night before except that Scott cut the light a little too much, as the red light glowed bright in the afternoon sun. So not too bad, Scott 1, Curt 1. As they say, a win is a win. June 13 we headed out to California, to shoot a commercial for Ford Motors. After driving across the Arizona / California desert, we finally reached our destination in Lebec, California. Lebec is located on the north side of the Grapevine, just about 40 miles from Bakersfield. This area has been used in various movies and commercials over the years, recently in Fast and the Furious. The temperatures were in the mid 60’s when we arrived, compared to the low 100’s when we left Arizona. We checked into our hotel and went out to a Mexican restaurant. We had a good meal, even if it was a little spicy for my dad, as he had to order a large glass of leche to cool his mouth. After twenty plus years in the southwest, you would think he can handle a little heat. Sunday we headed out to the location. We arrived at the staging area; it was like a small city out in the middle of nowhere. Trucks, trailers, tents, air conditioned restrooms, and a fancy restaurant on the side of the road. We met with the director and the production assistant to go over the concept of the segment. Then the crew started to go to work. Measurements and photographs were taken and they were off to various areas of the location to make things happen. For our little team, it was polish and touch ups, and the regular routine of prep for the Invader. Fueling and chute packing and so on and so on before the production assistant came and drove us down the road to the shooting location. They had a couple of cars set up near a small building and showed our mark. We were scheduled to shoot after lunch, but typically someone missed their time slot and we were asked to jump ahead. One final check out and we were off….. But we had no power!! Panels were flying off, wires and connections checked, battery voltage checked but no power. We found that the igniter batteries had shorted internally, while they charged and checked good, once a load was applied almost no voltage showed. Did I say we were in the middle of nowhere?? As a quick scramble on location for a suitable battery, with all the cameras, sound equipment, portable electronics, and so forth not a battery to be found, I quick search on the blackberry showed a motorcycle shop ten miles away on the top of the Grapevine. So a quick trip to the shop and we found a suitable replacement that would work with a slight rewire and we were back in business. So we were of towing down to the set, with a caravan of vehicles, cameras, and equipment. The Invader was positioned on its mark, along with the other vehicles, and the director went over again what he was looking for. He had expressed concerns with the location of this small building off to the side of the Invader. It was around 20 – 30 feet off to one side of the Invader, and looked fine. I had told him that it was no problem as we have stuff similar between to cars on the starting line and it should be fine. A look of panic on the director’s face, and the frantic waving arms of the production assistant gave me a clue to shut down. As I jumped out of the car, I felt a little sick, as a large section of the building seemed to melt off the building. They called a break for lunch as we towed back to refuel the Invader. Someone forgot to tell me that this was movie magic, and that the building was not brick like it seemed but very malleable plastic that can be formed with a hair dryer. Here I am the world’s biggest hair dryer blasting away near it. I figured we were done on the set, but everyone for the most part was in good spirits about it. After a lunch of stuffed crab and a filet of beef, we were back on the set and ready for take two. This time all was good, the building was moved a bit farther back, but all went well. Then they had me in the car for the still shot segments. After an hour in the hot sun, fully suited up and strapped in, we were again on the way back for fuel. Fuel and a quick charge on the batteries we were back for the last take. More fire and more noise were in the script, and then they asked if we could do a quick launch at the end. So after the fire, while I idled for a few moments, they pulled all the cars out of the shot and I brought the power up and launched a couple hundred feet. Everyone loved it and we excited that all went well. We loaded everything up and said our goodbyes and headed home. With an uneventful return journey we were ready for a small break. Our break lasted until the 3rd of July when we headed out to the new El Paso Motorplex located just outside of El Paso in Clint Texas. This is a new track with all concrete strip and state of the art wireless timing system. It is not finished yet, but is well on its way to being an excellent track. We pulled in on Friday night, and hung out with Donny Huerra and his Mexican Jumping Bean wheel stander and our competition, Gary Fore and the Super Cobra jet funny car. Gary is a nice guy and really down to earth, we played the “Do you know…” game as we have never met before. So as the weather cooled off, we headed to our hotel for the evening. Bright and early on the 4th proved it was going to be a hot day early on. We were scheduled to run starting at 8 pm, but we were there when the gates opened. Slowly towards the afternoon, the crowd started to pour in ready to celebrate the holiday. Around the eight o’clock hour we were in the lanes ready to get the show started. We pulled in and strapped in, and kick the tires and lit the fires. Gary and I traded fireballs for a bit, and then brought up the power for the burner pops. Once I did this, the Invader started to slide, as the track being so new there was not much traction for me to grab on to. So I had to lay of the pops, as I slid into the lights as not to red light. Gary pulled in and the lights flashed and he was off. I followed in pursuit of Gary, and as I went by I shut off the Invader. This was a safety run as there are not many lights in the shutdown area, and I wanted to get a feel for the track. It felt fine! Gary shot by me and took the first win of the night. Round two came and we had to do something about the traction, so just before we ran we loaded up the tires with some traction compound and crossed our fingers. She seemed to like that, after we started they gave me the signal to start the show, so I hit the first fireball and wait for Gary’s response. And waited. So I did it again and waited… and waited… Gary was having a problem starting, so after a couple minutes they gave me the signal for a single. A couple fireballs and burner pops later, to give a show but not shake Gary too much, I pulled into the staging lights. Then I saw a flash reflecting from behind me. Gary got her started, so I waited as he did a few pops and fireballs to lighten the load before pulling into the beams. Both of us staged, we waited for the tree forever it seemed, the Gary just left and I followed behind. Again I squeaked past Gary but at about 800 feet the Invader ran out of fuel, but I held him off enough for the win.With one win a piece, the final round was an all out battle. Blasts were traded back and forth until we slid into the beams. Tree was activated and we were off and running. A word to anyone running at the new track, a little piece of advice I learned, the ET boards are not the finish line! I clicked it off at the boards, and barely held of Gary for the final win of the night!! !